The U.S. women’s hockey team continued its international dominance, beating Canada 5-2 to take the Four Nations Cup on Saturday. Holders of the world and Olympic titles, the American women reinforced their status as the No. 1 country in the world in women’s hockey by beating their archrivals on home ice at the SaskTel Centre. “It’s great to be recognized as that,” U.S. forward Hilary Knight said. “We definitely put in the work. “It’s disappointing. You never want to lose on home soil,” Canadian captain Marie-Philip Poulin said. Canada won the majority of women’s hockey finals between the two countries in the first decade of this century, but the pendulum has swung to the U.S. in the second. “Definitely we want to be able to beat them in those big games,” Canadian forward Natalie Spooner said. 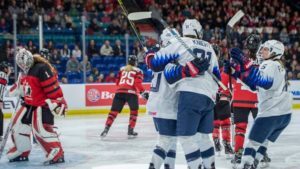 The Canadians produced a better start Saturday than in a 2-1 loss to the U.S. in the preliminary round, but couldn’t finish the few quality scoring chances they generated. The quickness and creativity of the U.S. attack was a handful for Canada’s defence in the second and third periods. “We have to win a little bit differently than they do. Goals don’t come as easy for us as they do for them,” said Perry Pearn, who is coaching the Canadian women for the first time. “Once you get behind 4-1 and you’ve been struggling to score goals, it’s a big mountain to climb. “I didn’t think we gave up, but what happens is now you think you’ve got to make the perfect shot and you pass up the things you have to do to beat the U.S. The 2019 women’s world hockey championships April 4-14 will be held in Espoo, Finland.